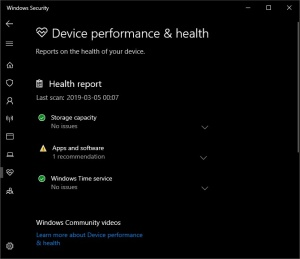 Starting with Windows 10 version 1709, the Device Performance & Health area can be hidden from users of the PC. This can be useful if you don't want them to see or have access to this area. 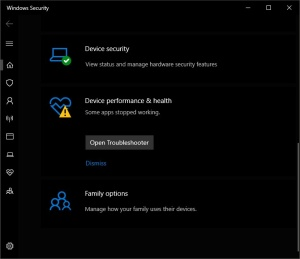 If you choose to hide the Device Performance & Health area, it will no longer appear on the home page of the Windows Defender Security Center app, and its icon will not be shown on the navigation bar on the side of the app. Is it possible to disable only the "Apps and software" section of the "Device performance & health" area? I've not seen a way to hide that section. You can "Dismiss" the found issue, but it does often return.